William Stuart was a partner in the firm of J&W Stuart, who, in 1869, were reputed to be the principal manufacturers of net in Scotland. The weaving of fishing nets was one of the oldest crafts in Scotland. In the late 18th century, James Paterson of Musselburgh had the idea of developing a machine to replace traditional hand weaving. He invented and patented a machine that “turned off row after row of meshes at a rate which would leave a dozen hand-workers far behind” [Bremner]. In 1849, William and his brother John bought the business from the estate of James Paterson. They developed it, building a new factory in Bridge Street, Musselburgh, which ultimately covered an area of 4 acres. William became involved in several business enterprises in America and Canada, including the first National Bank of Salem, Oregon. He became sufficiently well off that he was able to buy Feddal House in Perthshire. William Stuart, the son of an Edinburgh wine merchant, Alexander Stuart (1793-1873), and Mary Simpson (1792-1849) was born in Edinburgh, one of four children. The others were John (1818 –1877), Alexander (1822-1900) and Mary (1829-1907). William married Susan Anne Bridges (1825-1868), the daughter of a lawyer, and they had seven children. 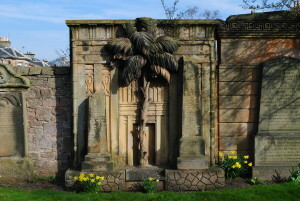 When Susan died, William commissioned the sculptor Robert Thomson to design the spectacular “Egyptian portal to the land of the dead” for the family tomb. Alexander Stuart’s memorial is three plots to the left of William’s. Both have a number of dedications, establishing a full history of the family. Alexander died in 1873 at the age of 80, but Mary had died over 20 years earlier at the age of 57. 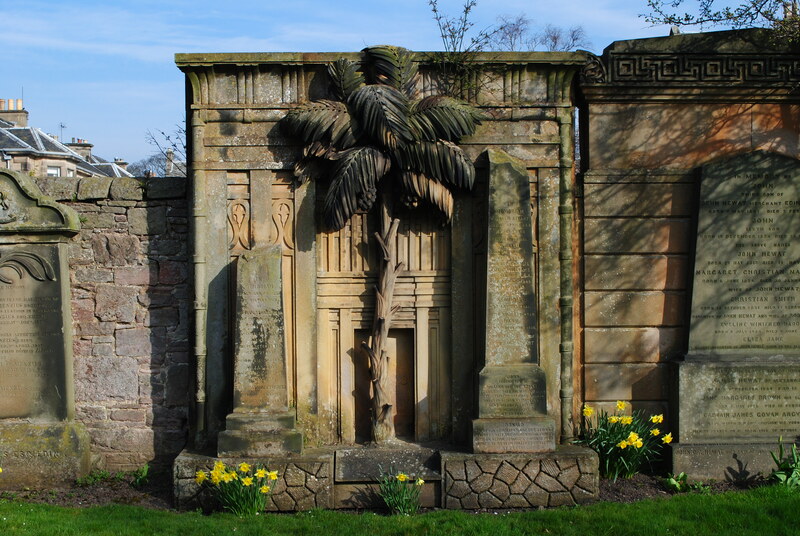 John, Alexander and Mary are all commemorated on Alexander senior’s monument. Only Alexander married, and his wife, Jessy Graham Simpson McGuaig (1825-1858) is also remembered there. Meanwhile, on William’s monument, five of his seven children are remembered. The eldest, James (1857-1874), died at the age of 16. The second son, Alexander (1859-1909), became a barrister, having studied law at Cambridge. He married Mary Crauford (-1936), and died ‘on a voyage from Norway to Scotland’. Archibald Stuart (1865-1936) and his son John James (-1964) are mentioned, as is their only daughter Mary (1856-1936). The third son, William (1860-1916), went into the family business. His wife, Sue Williams (1869-1949) came from Baltimore. Their three sons all had military careers. John (1898-1918) was killed in the First World War, Donald (1906-1940) died in the Second World War, and William, D.S.O. (1896-1976) died in 1976 at the age of 80. On Alexander’s headstone, the next generation is represented by a third Alexander (1858-1948), an advocate, and his wife Margaret Haig (1861-1934). Their two sons are also commemorated: the younger, David Aymery Stuart (1896-1916), worked in the Edinburgh Head Office of the North British and Mercantile Insurance Company before the First World War. He became a second lieutenant in the Cameron Highlanders, and was killed in an aeroplane accident near Corstorphine, in 1916, aged just 21. The elder, Alexander Haig Stuart (1989-1956), died in 1956, aged 67.